"Look at this lad, Johnny. Look at the joy in his eyes as he consumes each detail of your exploits. Look at his room. Contained within these four walls is a virtual shrine in your honor. His was a small, sad life, Johnny. Without friends, without true parental love and guidance. The death of this boy is not a burden for you to bear. He did not die because of you. It was through you that Tommy Hanson lived!" - omnipotent, multidimensional being The Beyonder, attempting to console Johnny Storm a/k/a The Human Torch, after the death of thirteen-year-old fan, Tommy Hanson, who set himself ablaze while trying to become his favorite hero, in Fantastic Four #285 (Marvel Comics, Issue Date: December 1985). Part of the massive crossover that was the wearisome Secret Wars II, Fantastic Four #285 begins in the office of Dr. Janet Darling, some type of coroner investigating the death of Thomas H. Hanson, a thirteen year old boy whose official cause of death is third degree burns. Dissatisfied with that brief clinical conclusion, Dr. Darling begins an investigation into the circumstances which led to Hanson's death (a more existential task which, likely, would exceed her formal duties in the real world). The narrative then flashes back to to the last few days of the life of Hanson, an all too familiar experience for many young comic book readers in the mid-1980s. Bullied, unpopular, and all too interested in the exploits of super heroes (which in his world exist not in fictional comic books but in news reports and celebrity magazines), Hanson idolizes The Human Torch, founding member of the Fantastic Four, sister of Sue Storm a/k/a The Invisible Woman, and young hero of New York City. Hanson is a latch key kid who rarely sees his parents, both of who maintain professional careers. On the day in question, at school, a stereotypical bully brandishes a new celebrity magazine featuring the Torch in front of Hanson's face and only agrees to give it to him if he will fork over his lunch money and do his homework for him. Later, a teacher confiscates Hanson's hard won magazine and attempts to explore with him his unhealthy fascination with the Torch. Hanson replies only that Johnny Storm is, after all, "the greatest hero ever! Better 'n Spider-Man, or Captain America, or Thor, or . . . or anyone!" Just tell the Human Torch that Tommy Hanson called. No, sir. He doesn't know me. I . . . I just wanted him to know my name. As Hanson lays dying in the hospital, Dr. Darling locates and informs Johnny Storm, who has just enough time to visit Hanson at the hospital before the young boy passes away. Storm's parents, heretofore absent, berate Storm from their newly dead son's bedside. Storm is devastated. He commiserates with his fellow team members and threatens never to become the Human Torch again. Upon this vow, he is visited by the Beyonder (whose insertion into the story seems a bit heavy-handed), who takes him into the past to observe Hanson's life. It is during these moments that the Beyonder gives the monologue cited above. The depictions of comic book fans themselves fall into two main categories, the direct and the metaphorical. Mainstream visions of comic book fans have usually been metaphorical. Some, such as Byrne's story, "Hero" (Fantastic Four #285 [December 1985]), have been sympathetic. Tommy Hanson, a devoted fan of the Human Torch, faces so much parental neglect and peer ridicule that he sets himself on fire in an attempt to become more like his hero. When the boy's parents blame the Torch for his death, the superhero briefly vows never again to use his powers. An omnipotent extradimensional creature named the Beyonder soon intervenes and shows the Torch the error of his ways by taking him back in time to see Tommy happy in his room, reading Fantastic Four. 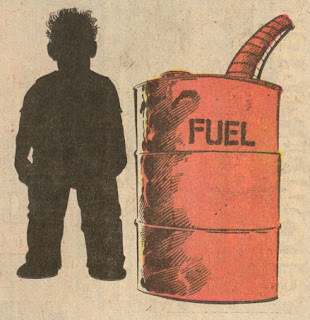 The Beyonder explains, "the death of this boy is not a burden for you to bear. He did not die because of you. It was through you that Tommy Hanson lived!" It is not difficult to make the jump between Tommy, the fan of the "real" Human Torch, and fans of the comic book superheros, turning the story into commentary on the role of superheroes in fans' lives. Comics do not make fans' lives one dimensional or lacking in human contact; rather, says Byrne, comics provide fans an escape, an outlet. My book is all about the world of comic book readers as I'm trying to explain what the comics mean to the people who read them. But I also wanted to get a sense of the opposite perspective as well: what do comic book creators think about the people who read their comics. How are fans depicted in the comic books themselves? Tommy Hanson isn't primarily a comic book fan. He's shown reading comic books, but the focus of his fandom is the Human Torch, someone who is a real person for him. Making the leap from someone who is a fan of (real life) superheroes to someone who is a fan of comic books that star (fictional) superheroes seemed reasonable to me. After all, it was in The Fantastic Four comic that readers learned that the team stars in its own line of comic books on the Marvel earth -- comic books that we on this earth read as if they are fiction. 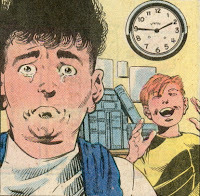 The scene in Tommy's room, where the Beyonder takes Johnny back into the past to see him happily reading, focuses on comic books. And when his parents lash out at the Torch, they blame him in the same kind of rhetoric that people have used to pin responsibility on comic books and other forms of popular culture. So the connection is clearly there. It's still a powerful comic book, especially for people who can see themselves in Tommy. 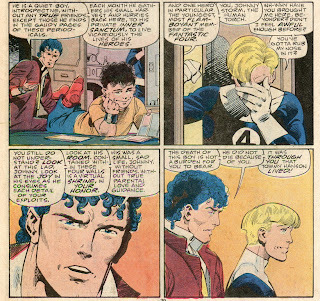 (Reading it again, I had to blink back a few tears when the Beyonder describes Tommy as being "without true friends, except those he finds in the gaudy pages of these periodicals.") In my book, I argue that his depiction is "sympathetic," but I'm not sure that I would go as easy on Byrne now as I did then. Tommy certainly seems to be a nice enough kid, and it's true that he's abused by his classmates, misunderstood by his teachers, and neglected by his parents. At the same time, though, he's not the brightest kid for 13. 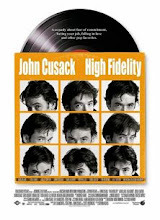 He falls for his classmates trick to get his lunch money for a magazine that Tommy should have been able to find anywhere, and then he gets himself in trouble by reading it in school. Maybe this is a sign of Tommy's obsessive tendencies, but it certainly doesn't reflect well on comic book fans. In fact, I'd argue now that Tommy is portrayed much like stereotypical fans: immature (his actions seem to be more like someone who's closer to 8 than 13), obsessive, less than smart, and potentially dangerous. Near the end of the story, Byrne (through the Beyonder) tells Johnny (and us) that he's not responsible for Tommy lighting himself on fire. Certainly his self-absorbed parents and irresponsible neighbor are more at fault. The Beyonder explains that superheroes (and comic books)d on't make fans' lives one-dimensional and so empty that they light themselves on fire. 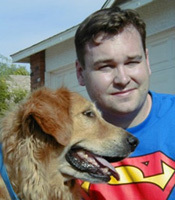 Instead, comics and superheroes give fans an outlet, a way to live their lives vicariously through people they idolize. This may be a positive service that comic books provide, but that doesn't really say very much in support of the average comic book fan. So, I guess the bottom line is that the story holds up (I'm always impressed by the way Byrne is able to give so much life to secondary or even tertiary characters who will never appear again) but that my interpretation of the story doesn't. I guess I need to go back and re-write my book! Although spoken in an attempt to console the Torch, The Beyonder's words are not entirely sympathetic or even appropriate. Essentially, the Beyonder consoles Storm by telling him that Hanson's attempts to live vicariously through him were what made his life worth living to him, and thus, Storm should not lament or feel responsible for his death. What lies in that message? Does it not lessen the life of Hanson to imply that he was happy only because he would sublimate his own identity to live through the exploits of a hero celebrity? There is an element of dehumanization implicit in his remarks: Tommy Hanson may be less than a human being for not living his own life, but at least he could be distracted from his troubles by reading of a hero actively living his own life. (You would think, too, that Storm would simply ask the omnipotent figure to resurrect the boy, but in comic books, resurrection is only for characters whose reappearance will sell issues. It is not a reward for minor human characters who serve as plot devices in single issues.). Further, it seems a bit strange that Storm would not have to deal with the media consequences of such a death. Who cannot imagine such a tragedy finding itself onto the front page of the New York Post? Would it really be the place of a coroner to investigate the social and situational issues leading to the child's sad demise, or would that be the task of an investigative reporter, or better yet, a lawyer retained by his parents to sue the Fantastic Four (whose pockets are deep enough to justify such a lawsuit)? Why didn't this story linger for several issues, or perhaps a year, for Storm to deal with the consequences of his actions? And was such a tragic accident truly as unforeseeable as Johnny Storm's grief suggests? Certainly, if the Marvel Universe is anything like our own, then children injure themselves using certain products in an attempt to emulate television and cinema. This should not be a surprise to a hero who regularly visits outer space, fights aliens and monsters, and generally sees death and destruction on a rather frequent basis. After all, was it not eight years before this issue appeared that Saturday Night Live parodied cheap Halloween costumes and "a bag of oily rags and a lighter" sold as a "Johnny Human Torch" costume? In the end, Storm revokes his promise to never become the Torch again, Joss is imprisoned, and everything is, for the most part, tidily resolved. 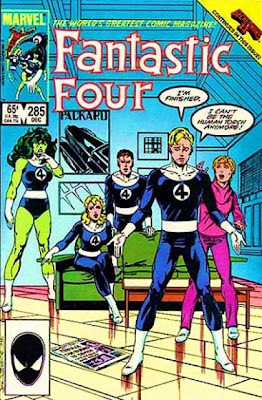 Fantastic Four #285 certainly seems to be an issue that has lived on in the memory of its readers, as evidenced by Pustz's commentary and a handful of Usenet postings over the years. There is no true villain, unless you count fame itself, which is why it may be memorable. Comic books often portray their fans in accordance with the very same negative stereotypes which society at large associates with them, and this work sounds like no exception (though I haven't read it). My theory on this phenomenon is that it stems from a socially reinforced self-hatred: comic book creators are themselves comic fans, themselves exhibit said negative stereotypes, and, finding themselves finally in a position of power, pass the stereotypical buck, as it were, on to their own fans. Dave Sim, admittedly a particularly bitter comic writer, was accused of this very crime by his own fans (wish I could remember a citation here, though it was probably online somewhere) when he lampooned the wimpiness of comic book fans in his Guys storyline. Obviously, there are exceptions to this trend, but it's surprisingly widespread. I wonder how much of plot was derived from the mid-80's sensitivity to parents' groups blaming popular media for accidental deaths and the decline of youth. Perhaps this thread still continues, but not having children and no longer legally a child, the topic isn't really in my sphere any more. At the time, however, every record was suspect, Dungeons and Dragons was supposed to teach impressionable youth to enter sewer systems and go crazy, and the PMRC was not far off from being formed. I've not read this story, so I'm shooting in the dark, but it is interesting to see Byrne penning a story which tackles the topic of misdirected blame and guilt with Johnny Storm as the stand in for the comic creator and the Beyonder/ God-Like-Diety absolving Byrne/ Storm of any part in the death at a time when this was such a hot button issue. Rather, Byrne places Storm as an unwitting hero in the boy's life, even as his inspiration leads to the boy's death. It would be interesting to hear Byrne's own words on this issue 20 years out. And, heck, given his well supported online fan forums, he may well read the post. I'd keep an eye on his site for updates to see if he comments on the issue. And no dig at Byrne, but... Why, Beyonder? Why the bad hair and 80's-tastic look in both Secret Wars? Even at the time, I recall thinking the Beyonder needed a fashion consultant. He's clearly Superman with a bad stylist. So tragic. Maybe the comic is really just a reference to the Judas Priest-inspired suicide attempts of the late eighties. Or maybe the Beavis and Butthead inspired fires of the early 1990's. This pre-dates Beavis and Butthead by a few years, taking place just before Byrne took off to work on Man of Steel. In my reading and personal interpretation of this comic book, I felt that the Beyonder meant something non-subjective in telling the torch "Hanson lived through you" . The beyonder isn't a therapist or an ordinary outside observer. Therefore when he makes a statement, it is authoritative. Especially when it's a completely discretionary, as is the case here. The conclusion I draw from the story was this: there are some lives that are doomed by circumstance to unhappiness. We like to pretend that anyone of us can overcome the challenges that our lives give us. But it's demonstrably true that this isn't the case. When the beyonder says Tommy Hanson lived through the Torch, he meant that the few moments of joy that this boy enjoyed in his brief, tragic existence were from reading about his hero. The boy's life wasn't defined by the Torch, it was defined by the cold realities of being denied fundamental human need for companionship and a nurturing adults. For Johnny storm to assume guilt for the boy's suicide is to confuse circumstance with cause. That's the beyonder's point. That's the profundity wrapped up in this issue.